Nike – Do Or Don’t Do It? By now nearly every marketer and sports enthusiast is familiar with the new Nike ad featuring Colin Kaepernick, former San Francisco Quarterback who is, perhaps, better known for starting a movement to protest racial injustice by taking a knee during the American National Anthem than he is for his exploits on the NFL gridiron. It’s a moving, evocative ad. If you haven’t seen it, you can find it here: https://www.youtube.com/watch?time_continue=2&v=7CwY5atbYnE. I’m not going to weigh-in on whether the ad will generate incremental sales. In fact, at the time of this writing, online sales are reported to be up by 31%. However, this may represent a short-term reaction that may or may not precipitate a longer-term decline. I do know that before I went forward with Colin Kaepernick I would have tested the ad, particularly to ensure I was not alienating Nike loyalists and it wasn’t undermining the meaning of the Nike brand. Our role as marketers is not to gamble the company’s resources but invest it behind initiatives we know work (from testing) and will build and/or strengthen brand equity. • It undermines the meaning of the brand – The brand is about achieving success in the highest level of athletics. All of the people who are featured in this moving video sacrificed to realize great athletic achievements. While Mr. Kaepernick is a world class athlete (you have to be just to reach the professional ranks) he is not of the same caliber of those depicted, at least not yet. Additionally, the brand linkage between Nike and achievement in sports, or sacrifice and achievement in sports, has been unseated by Mr. Kaepernick’s highly controversial way of protesting. I think more appropriate selections might have been Muhammad Ali who was stripped of his boxing title and license for being a conscientious objector during the Vietnam War to regain his championship title; or Billie Jean King, a pioneer for gender equality and social justice, who beat Bobby Riggs on the tennis court and won 39 Grand Slam tennis titles. • It’s politically charged – The saying is “don’t talk about politics or religion,” which is good advice if you want to stay out of trouble. Yes, his protest is about racial injustice, but he is doing it in a way that disparages the ultimate sacrifice, giving one’s life for one’s country. The National Anthem has been a ritual at sporting events to honor those who have fallen while defending our nation. While I believe the vast majority of people will stand up to fight racial injustice, kneeling during the ritual to honor those who have given their lives for others is polarizing to the extreme and contradicts the notion of great “sacrifice.” Moreover, as another saying goes, “people in glass houses should not throw stones.” Nike is opening itself to criticism for hypocrisy – the high prices of its apparel (particularly the Air Jordan line of the past), which cost more than minority inner city kids can afford. Additionally, Nike has less than a stellar record of social justice given alleged claims of engaging in sweat shop labor, exploiting children and poor people in underdeveloped countries. • It may alienate loyalists – While I’m not troubled by bipolarity of responses to an idea, I am troubled in those cases where one alienates loyalists. When you alienate loyalists, you lose them. And, if you think you will offset that loss by appealing to a whole new corps of customers then think again. The New Coke experience provides ample evidence that you are unlikely to do so. 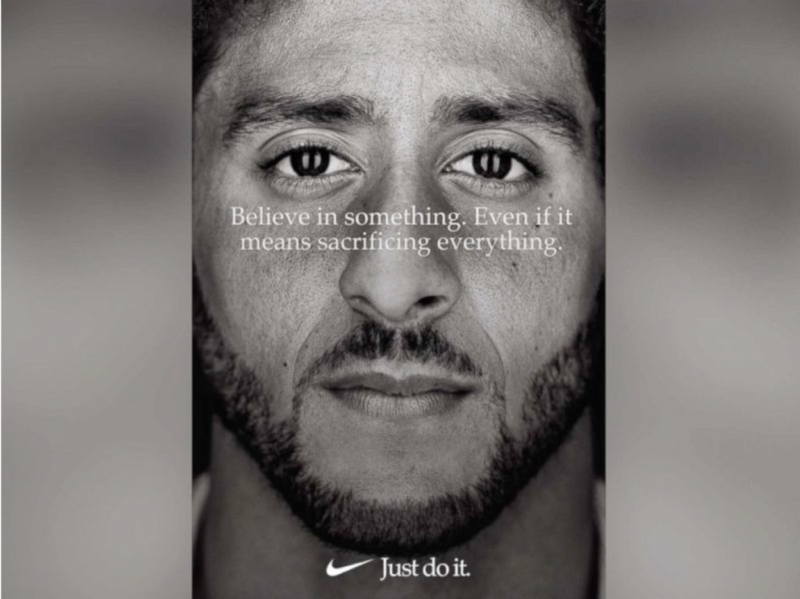 So, regardless of the short-term impact on sales, or the evocative nature of the ad, or its tribute to fighting for what you believe, if it risks tarnishing brand equity I’d say, “Nike. Just Don’t Do It!” I, for one, wouldn’t.